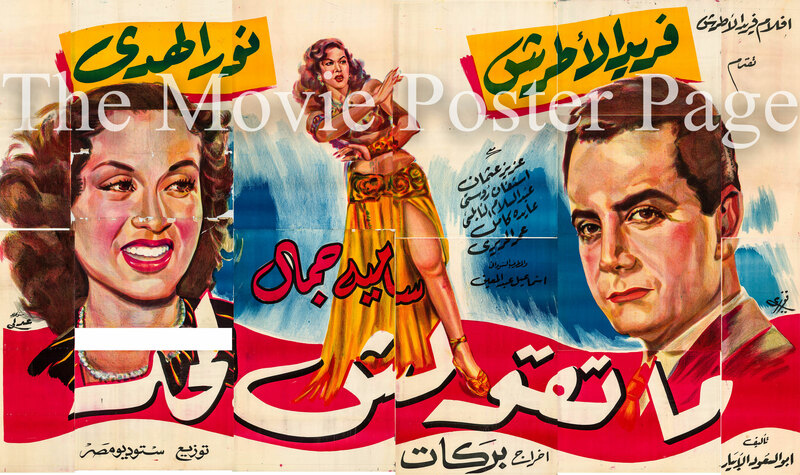 This is a 67" x 104" 14-piece Egyptian billboard designed by Hussein Fawzi of Studio Adly to promote the 1952 Henry Barakat musical Don't Tell Anybody based an a story by Abu Seoud El-Ibiary, screenplay by Henry Barakat and starring Farid Al Atrache as Wahid. Plot summary: Wahid the musician loves a dancer named Wela [Samia Gamal] and proposes marriage to her after her return from a business trip. However while Wela is away Wahid marries a singer named Nousa [Nour Al Hoda] as part of a ruse arranged by Nousa's uncle Ghazal, [Stephan Rosti] who wants to marry Wela.